Transformer is a static device that converts one voltage level to another voltage level. Due to occurrence of iron and copper losses, the transformer gets heated. In order to avoid deterioration of insulation, dissipation of heat is required to keep the temperature of the winding within a limited value. 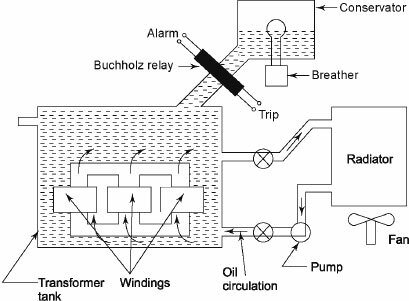 Since transformer is a static device, its cooling is more difficult than that of a rotating machine. Rotating machine creates a turbulent air flow, which helps in removing the heat generated due to losses. The losses in a transformer are comparatively small. The coolants used in transformer are: (i) air and (ii) oil. The dry-type transformer uses air as coolant, whereas oil-immersed transformer uses oil as cool-ant. The heat produced in dry-type transformers is conducted across the core and windings. Finally, the heat dissipates from the outer surfaces of the windings to the surrounding air through convection. The heat generated inside the core and windings of an oil-immersed transformer is conducted across them to their surfaces. This heat produced is transferred by the oil to the walls of the tank through convection. Natural air: Ambient air is used as the cooling medium in this method, and the natural circulation of surrounding air is used to carry away the generated heat by natural convection. Air blast: Natural circulation of air used in cooling becomes insufficient for dissipation of heat from large transformers. Therefore, circulation of air (air blast) is used to keep the temperature rise within prescribed limits. 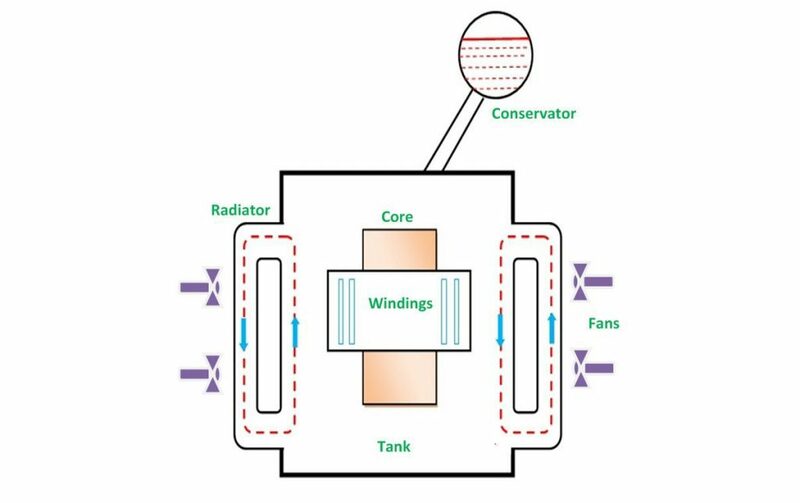 A continuous blast of cool air is forced through the cores and the windings to cool the transformer in this method. External fans are used to produce air blast shown in Figure 1.17(a). Generally most of the transformers are of oil-immersed types because oil provides better insulation than air due to its better conduction heat. Mineral oil is used for this purpose. The following cooling methods are used for oil-immersed transformers. Oil-immersed self-cooled transformers: The transformer is immersed in oil. The heat generated in cores and windings is passed to the oil by conduction. Therefore, oil in contact with the heated parts rises and cool oil takes its place. The heat is transferred to the tank walls by natural oils. Finally, ambient air takes this heat. To increase the heat dissipating capacity, corrugations, fins, tubes (shown in Figure 1.18) and radiators are to be provided in Figure 1.17(b). In oil natural cool-ing, there is no chance to clog the ducts and hence windings are free from the effects of moisture. Oil-immersed forced air-cooled transformers: In this method, air is directed over the outer surfaces of the tank of the transformer immersed in oil. Oil-immersed water-cooled transformers: In this type of cooling, water is pumped through a metallic coil immersed in the oil just below the top of the tank to extract heat from the oil. The heated water is cooled in a spray pond or a cooling tower. Oil-immersed forced oil-cooled transformers: To extract heat from the oil, oil itself is pumped upwards through the winding. Then it is sent back by way of external radiators. These radiators are cooled by fans. The extra cost of pumping equipment should be justified economically. The main advantage is the reduction in temperature difference between the top and the bottom of the enclosing tank. Figure 1.18 shows the schematic arrangement of air blast cooling used for high-capacity transformers. Table 1.1 summarizes methods of cooling of transformers.